Every year for the past oh, about 16 years now, I have picked blueberries at Macombers Blueberry Farm. It’s sort of become a family tradition to go take a ride out to Western Coventry and travel down Mr. Macomber’s dirt rode to pick some of the finest blueberries in Rhode Island. This year I was late. I usually pick at the end of July, but this and that got in the way. You know how this and that can be. Luckily Mr. Macomber is technically savvy and he made a Macombers Facebook page so it was easy to see when the patch was open. We finally made it late last Friday afternoon. It was a little harder to pick than usual but the berries were still plentiful, we just had to dig a little farther into the bush to get them. We picked 8 pounds, most of which were frozen for use over the winter. 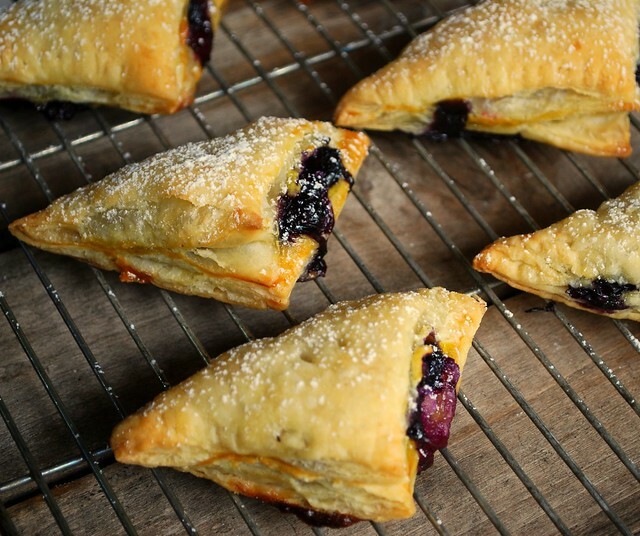 I did reserve some to make these scrumptious Blueberry Vanilla Cream Cheese Pies. Heaven I tell you. 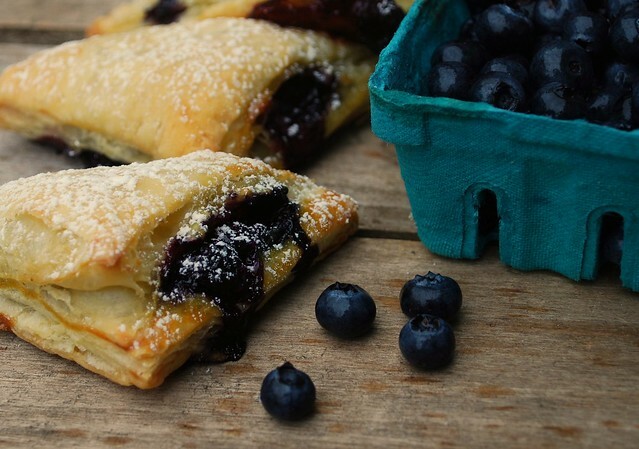 Flaky puff pastry stuffed with a creamy blueberry filling. Jesse was eating them straight outta the oven. Look for my notes to see how I adapted the recipe to make these mini pies. Position the racks in the top and bottom thirds of the oven and pre-heat to 375. In a medium bowl combine the cream cheese, 3 tablespoons of the sugar, the vanilla bean seeds (or extract) and 1 of the egg yolks. Mix with a wooden spoon until well combined. Combine the blueberries, 2 tablespoons of the sugar, the cornstarch, crème de cassis (or Chambord in my case) and salt in another medium bowl and mix gently. On a lightly floured surface, roll each pastry sheet into a 10 inch square……..arrange on a parchment lined baking sheet. . *See my notes - I did things a little differently. In a small bowl, beat the remaining egg yolk with 1 teaspoon of water. Brush the outer edge of each pastry in the egg wash. Dollop ½ tablespoon of the cream cheese mixture in the center of each pastry. Top with 1 tablespoon of the blueberry mixture. Fold in half to seal, pinch edges. Sprinkle with ½ teaspoon remaining sugar. With the tip of a paring knife, cut a steam vent in the center of each pie. Bake until golden brown, about 25 minutes, swapping and rotating the baking sheets positions about halfway through. Cool slightly on sheets then transfer to a rack to cool completely. Sprinkle with confectioners’ sugar before serving. I rolled one piece of puff pastry out into a 10 inch square. I then cut it into 9 equal squares. I dolloped the cream cheese mixture and the berries in the center and then picked each one up (just like you were sealing a dumpling) and pressed the edges together. I then took a fork and crimped the edges. The berries are still going to seep out a little. There really is no avoiding that. I think it just adds to the rustic charm! So this recipe made 18 mini pies for me. Oh, I should not read your blog before breakfast. These look amazing and I'm wishing I had one (or two!) to eat while I drink my coffee. Okay, we're surely doing these. I posted it on our RusticWeddingStyle facebook page, too. Can't you just see these as an easy treat for a bridal shower?! That gorgeous photo got me! Now I've printed it out, and can't wait to try it! Wow, these look delicious! 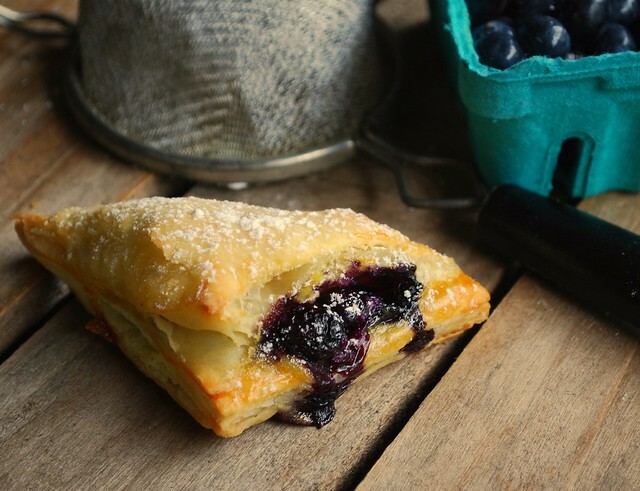 I love all that you can do with Puff Pastry. The blueberry mixture sounds great with the Chambord - it kind of kicks the recipe up a few notches. Thanks for sharing this!! I love blueberries! I'd like one of these for lunch right now...yum. Just found your blog through Tumblr!! It's gorgeous! sigh, so much for the diet. I had some frozen blueberries and cream cheese in my fridge that I needed to get rid of. I googled the two items and found your recipe. They turned out amazing! Thank you for posting! I had some cream cheese and frozen blueberries in my fridge I needed to use up. I googled the two items and found your blog entry. Thank you for the idea, they turned out amazing!